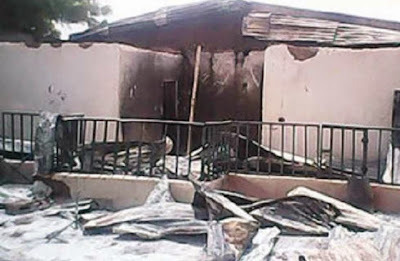 The Kano State Police Command has arrested 15 persons in connection with the recent burning of a Baptist Church at Gidan Maso village in Rogo Local Government Area of the state. Also, the Emir of Kano, Alhaji Mohammed Sanusi II, summoned the Hakimin Rogo (District Head), Dagacin Kadana, Chairman Christian association of Nigeria (CAN) in Rogo L.G.A, Rev. Bulus Fara, the Baptist Church Pastor, Rev. Haliba Garba and the CAN P.R.O of Rogo Mal. Kabiru Garba to his palace over the matter. It would be recalled that on April 1 at about 7:30 pm, the residence of the Pastor, Rev Habila Garba was burnt by irate youths, while one of his daughters died of suffocation. This occurred barely a week after another branch of Living Faith Church popularly called Winners Chapel in Giwa, Headquarters of Giwa Local Government Area of Kaduna State was burnt by two unidentified arsonists. Although the Kano State government sent one Alhaji Is'haq to assess the situation, the Christian community was said to have been disturbed by his statement in Hausa language which interpretation means that "such an insignificant issue and destruction (where a life was lost) does not call for any mention at all, yet we went about publicizing it to the whole world." Four of the youths were however said to be "roaming about boasting and threatening the Christians because they have not been arrested." The President of "Tarayyar Masihiyawan Nijeria" (Hausa, Fulani and Kanuri Christians), General Ishaku Ahmed Dikko (rtd), stated these while giving situation report of the incident on Sunday in Abuja. "The Nigerian Police went and inspected the damage and on April 5 they arrested six youths. Later on, they went back to arrest 9 more who are all at the Kano State Police Command C.I.D. The action of the Police pacified and encouraged the Christian Community. One of our own, Barrister Inusa Bako, is representing our interest and monitoring the prosecution which is now in the hands of the Kano State Commissioner of Police.